$100 Gift Certificate to Thompson Alchemists?? SIGN ME UP! 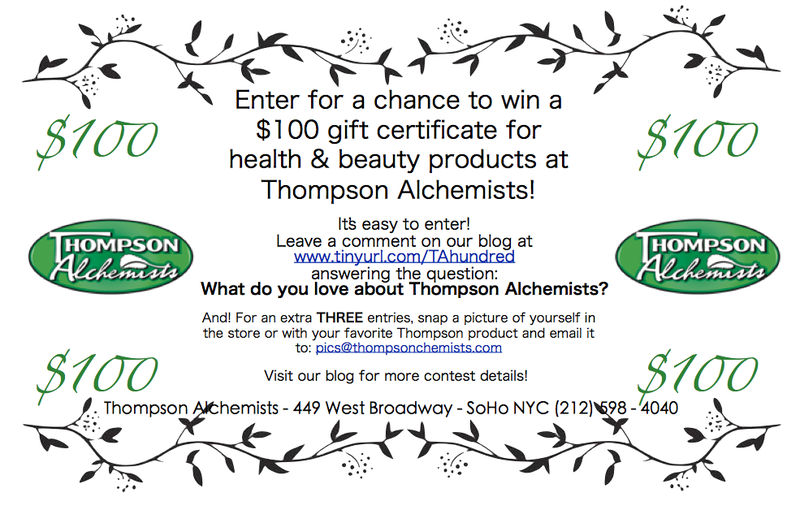 Comment on this blog answering the question: WHAT DO YOU LOVE ABOUT THOMPSON ALCHEMISTS? Be sure to include your name too! Easy right? Because that’s not all — if you wanna quadruple your chances, snap a pic of yourself in the store at 449 West Broadway or with your favorite Thompson product and send it to pics@thompsonchemists.com for an extra THREE entries.. The contest runs until Sunday, September 9th 12AM EST and we will announce the winner on Monday, September 10th by random drawing so check back to see if the $100 is yours to claim! Good luck to everyone! In the event that there are less than 75 entries, Thompson Alchemists reserves the right to cancel the contest. By emailing a picture to pics@thompsonchemists.com, you grant Thompson Alchemists the right to post it on Facebook, the Thompson Alchemists blog or Twitter. That’s an easy one for me. What I love about Thompson Alchemists is that you guys carry Wilkinson’s Double Edged razors at an awesome price. Imagine how many Wilkinson blades you could get with $100! 😛 Good luck! To ask us what we love about TC is a harder question than one would think. There’s so many wonderful things about your stores, whether it be the people who work there, who are always smiling and eager to help, and not to mention creative! Those decorations and the witty names for their nail polishes? Super impressive. Now for the products you sell, I don’t know where to begin. I’ve been introduced to SO many new wonderful products that I use a daily basis now. I went to an event at one of your locations and pretty much acted like a fan girl when a representative of NUXE was there. It’s hard to find a place that’s genuine, and awesome at the same time in this big city, and that’s exactly what you guys are! *tears* That was beautiful Kaitlin, Thank you so much! 2. They carry my favorite French brands. I love that you carry such a broad variety of beauty items. I can get everything in one place and there is always something new and exciting to try. Thanks Diane! We can’t wait to meet you in person, but you can always shop online! I love that you carry so many hard-to-find/international products! Lavido has been an amazing find — Vanilla Patchouli lotion for me, and the Lavender hand cream for the perfect gift! Obviously I’m also a huge fan of the lovely ladies in the shop! Wgat I like about Thompson Alchemists this was my first visit. Everyone was friendly I ended up buying Marrekesh shampoo. Thanks Natasha! We loooove the Marrakesh shampoo, did you try out the oil too? Our staff goes gaga for it! Thanks for sending the gift certificate I can’t wait to use it! Awww, we can’t wait to see you!